The supplier does not allow discounts on this item, but receive $1.50 in reward cash to use on any future purchase. worth $1.50 in future purchase credits. "I've waited more than twenty years to read this book, and the wait was worth it. If you've spent years looking for magic but have only been finding tricks, this book may contain the secrets you've been searching for." "This is the most difficult book on magic you are ever going to read, and it might upset most of your beliefs about magic, and maybe even change your life. It is only for those who believe that magic is an art and a science, and who are willing to use their head and open their hearts. But if you do so, you will be rewarded with the love and the insight from someone, who is possibly the most important and influential magician that has ever lived. 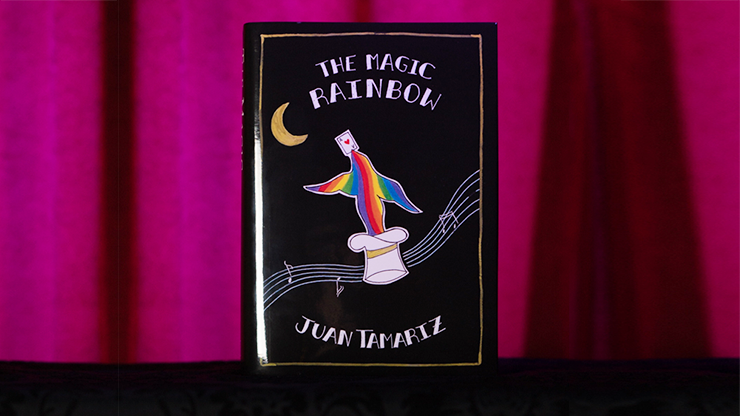 Never before has a book on the theory and philosophy of magic contained so much practical guidance and artistic vision as Juan Tamariz's The Magic Rainbow." "The Magic Rainbow is an awe inspiring look through the eyes of a true master, the depth of thought and understanding is that of a genius. Juan's passion for magic leaps off every page. We are lucky to both have this book and that Juan chose magic as his passion." In explaining how the magician can achieve this goal, Tamariz provides remarkable and original techniques that make it possible to erase bits of memory that might lead to the method of the trick, and how to enhance and create memories that build the impossibility of the effect both immediately and in the future. He gives an original strategy for dealing with technical mistakes when they happen during performances. He explains why and how comedy and drama combine with magic, in both bad and good ways, how to make the most effective combinations for creating astonishing and memorable magic-and much more. The Magic Rainbow is Juan Tamariz's magnum opus on magic-performance theory. It presents essays, explanations, revelations, insight and analysis-forty years of thinking by the world's most respected and beloved magician. Above all, The Magic Rainbow is Juan Tamariz's love song to magic and magicians, with lyrics that will guide your performances to their highest peaks and your audiences to the rainbow of magical emotion.